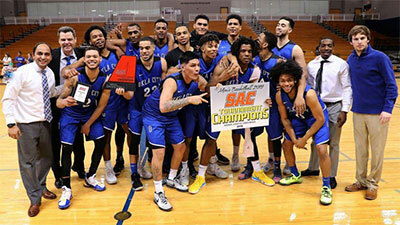 Trae Bryant (6'1''-G) brought Oklahoma City University its 10th Sooner Athletic Conference men's basketball tournament championship with the winning layup in a 74-73 triumph over John Brown on Saturday at Abe Lemons Arena. Bryant, a junior from Wilmington, N.C., drove the lane for the crucial bucket with 4.6 seconds remaining. Oklahoma City (21-10) raked in the conference's automatic qualifying bid for the NAIA Division I Tournament. The Stars reached the NAIA Tournament for the fifth year in a row and 25th time overall. OCU earned its first SAC Tournament crown since 2013 in its 13th title game appearance. The NAIA will unveil its national-tournament pairings 5 p.m. CST March 13 via its Facebook page. "This has been a hard year for everybody with the injuries, with the ups, the downs, with the back ups again," OCU coach Vinay Patel said. "And to just cap this thing off like that, I'm just happy for those kids in the locker room. That's what it's about. That's the experience we sell in recruiting is a chance to play for something special." Chris Williams (6'1''-G) stood front and center for the Stars with 22 points, four rebounds, two blocked shots and two steals. Williams, a senior from Denver, shot 9-for-10 behind the free-throw stripe. Williams collected tournament most valuable player after fueling OCU's tournament run with 17.0 points, 4.7 rebounds and 1.33 steals per game. He shot 29-for-32 from the foul line over the past three games. Bryant totaled 13 points while shooting 5-for-6 from the field to notch his 11th double-digit scoring performance of the season. Bryant became an all-tournament performer with 9.3 points a contest during the SAC Tournament. Elijah Christman (6'5''-F) provided the Stars with 11 points, four rebounds and a 3-for-4 shooting performance from 3-point land Saturday. Christman, a senior from Justin, Texas, took all-tournament acclaim after averaging 14.7 points and 5.0 rebounds a game with 12-for-13 shooting from beyond the arc this week. Christman sank his first 11 3-point attempts throughout the SAC Tournament. Oklahoma City erased an 11-point second-half deficit. Densier Carnes (6'6''-F) hit a lay-in to put John Brown ahead 47-36 early in the second period. OCU stormed back with an 11-0 run as Eric Wattree (6'3''-G) nailed two treys and Anthony Davis hit another 3. Over the last 13:54, there were nine ties in the game. Williams canned a pair of foul shots for a 72-70 Stars edge with 28 seconds to go. Jake Caudle (6'1''-G) and Josh Bowling (6'6''-F) hit free throws to give the Golden Eagles a 73-72 lead with 12 seconds left. After Bryant's lay-in, Bowling fired a 3-point attempt that clanged off the rim as time expired. "I'm just so excited they figured out a way," Patel said. "It wasn't a pretty game by any means, but they figured out a way again to get the job done. The feeling I have is that, excitement for these guys. There's guys who have never been on that ladder and cut a piece of net down. To me, that's the most fun thing. That's what you go through all the pain for, that's what you go through everything for throughout a season is the opportunity to do that." Caudle led 18th-ranked John Brown (23-10) with 19 points, while Quintin Bailey (6'7''-F-97, college: Citrus JC)y added 18 points and two steals on 8-of-10 shooting from the floor. Caudle grabbed the tournament hustle award, and Bailey and Desmond Kennedy (6'3''-G) were John Brown's all-tournament honorees. Defensive Player of the Year: Anthony Black (5'7''-PG-95) of MidAmerica Ch. PG: Anthony Black (5'7''-PG-95) of MidAmerica Ch. Justin Bogle (6'8''-F) of MidAmerica Ch. Charles Beauregard (6'3''-G) of MidAmerica Ch.